Unlike yesterday’s word, nefarious, noisome, to my ear doesn’t sound anything like its meaning. 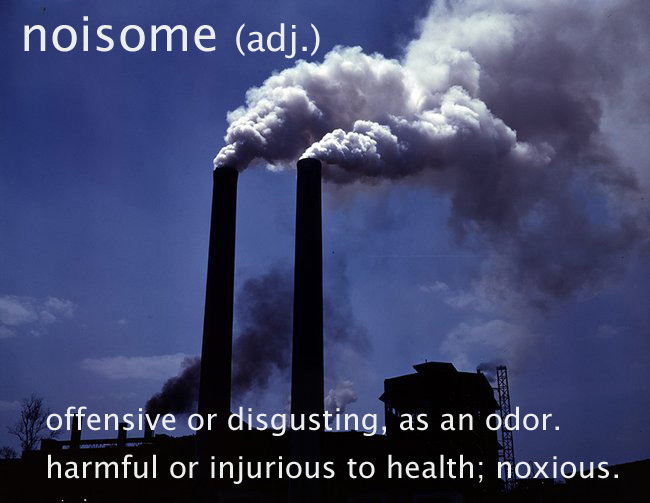 Despite looking like “noise,” noisome actually derives from the same root as annoy. A skunk uses a noisome odor as its defense mechanism. Many chemicals have a noisome odor. Such odors, or at least our perception of them, are our own defense mechanism. Consider the noisome odor of decay. It’s unhealthy, and our repugnance at the odor is like a warning. Sometimes those things that repel us also save us as we dare not drink the foul waters of a stagnant pond filled with noisome decay. More dangerous are the intoxicating odors that lead us to imbibe their poison like the Lily of the valley. Do you have a favorite word that doesn’t sound like its meaning?